Plantar fasciitis is inflammation of your plantar fascia. It can typically become painful when putting weight on the heel first thing in the morning and this pain often lessens as the day progresses. If it is severe enough it can prevent walking altogether or it may be painful throughout the day. This condition is known to affect around one in ten people at some time in their lives. 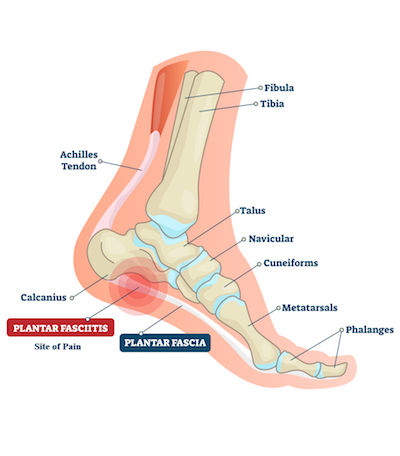 It is more common for people between the age of 40-60 to suffer from plantar fasciitis, but it can occur at any age. Plantar fasciitis is well known for being difficult to treat, often lasting many months or years and can cause ongoing pain for many clients. It usually gets better in time, but chiropractic care can speed up recovery. Our feet have an arch known as the longitudinal arch that flexes and straightens when we bear weight. It is held up by a muscle called tibialis anterior (supplied by L5 nerve from the lower back). This important arch has a very strong, thick band of tissue (plantar fascia) that connects the calcaneus (heel bone) to the bones underneath each toe holding the arch in place. Chiropractic care can be very effective for plantar fasciitis as it is caused by a number of factors occurring at the same time. The following aspects need to be addressed. Improving the movement of the bones of the foot. As most of us walk on very hard surfaces in shoes, the joints and bones of the foot experience repetitive force without the variety of smaller movements that our feet are designed to experience. Bones of the foot can begin to lock and become stiff, contributing to this condition. This is especially true of movement of the longitudinal arch which involves many of the integral bones of the foot (tarsal bones). The best footwear. The forces we experience through our feet can be magnified by too much grip on our shoes, insufficient padding and unsupportive shoes. The correct footwear is important for the type of walking and standing that you often do. Occasionally shoes enter their mid useable life and start to lose padding and support. There are good inserts that can address this problem. Improving gait. The way movement is generated from the lower back, through the pelvis, into the hips and down the knees greatly effect the forces and strain that the feet experience. It is rare for a client to have plantar fasciitis and not have poor patterns within the gait. Tasks to do at home. Together with specific structural care it is important to follow daily home help. This involves exercises, stretches and other home activities that are essential to long term repair. Chiropractic care has been reported as being effective for achieving good results with plantar fasciitis when the above approach is used. Healing of this painful injury can typically be elusive and prolonged without proper treatment. By restoring the correct movement to the gait of the foot, mobility to the transverse and longitudinal arches, improving the function the lower back, pelvis, hip and knee, it is possible to reduce the pressure on the insertion of the plantar fascia and allow it to heal. If you, your family or friends have concerns, call our office today on 01603 764777 or email reception@inspiredchiropractic.com to make an appointment.